The end of this month, January 31, will be a special day for those who are up in the pre-dawn hours. We’ll have a “blue moon”, “supermoon”, and a total lunar eclipse. This triple header last happened in 1866. First some stats and then I want to talk a little bit about the “blue moon” and “supermoon” part. A lunar eclipse happens when the full moon passes through Earth’s shadow. If the full moon passes through the partial shadow region, called the penumbra, we call it a penumbral lunar eclipse and it usually is difficult to see the slight dimming under the best of conditions. I don’t bother mentioning penumbral lunar eclipses because Bakersfield skies are not “the best of conditions”. If part of the full moon passes Earth’s total shadow region, called the umbra, we call it a partial lunar eclipse and you’ll notice a dark rounded shadow boundary on the moon. If all of the full moon passes through Earth’s umbra, we have a total lunar eclipse. Eclipses of any type do not happen every month even though the moon orbits Earth in about a month because the moon’s orbit is tipped slightly (just 5 degrees) with respect to the Earth-Sun plane. High in the west, the full moon will begin to enter the penumbra at 2:53 a.m. our time as viewed from Bakersfield. Because the moon is so close to us, there is a parallax effect that will make the times I quote about 2.5 minutes later than what you’ll see from the astronomy magazines or NASA website. You’ll begin to see a chunk taken out of the moon when it enters the umbra at 3:51 a.m. and the moon takes on the cool orange-red color when the moon is totally in the umbra between 4:54 and 6:07 a.m. lower in the west. The moon takes on an orange or red color during totality from the sunlight bending through the earth’s atmosphere scattering away the blues and greens, so only the oranges and reds make it through. We won’t see the moon completely leave the umbra because the moon will set about 15 minutes before then. The attached star chart has an inset with the stats and the star chart shows where the moon will be in Cancer at mid-eclipse. The phrase “once in a blue moon” used to mean a very long time in the common usage but there was actually a way to calculate it long ago that involved the lunar calendar used in the timing of Easter and Lent. Usually, a three-month season has three full Moons. If a season had a fourth full Moon, the third full Moon of the set of four was called the "Blue Moon”. However, a mistake in interpreting the old rule in a May 1950 issue of Sky and Telescope led to the current definition of a blue moon being the second full moon within a month. You can read more about blue moons on the “Once in a Blue Moon” page on the William M Thomas Planetarium’s website a. 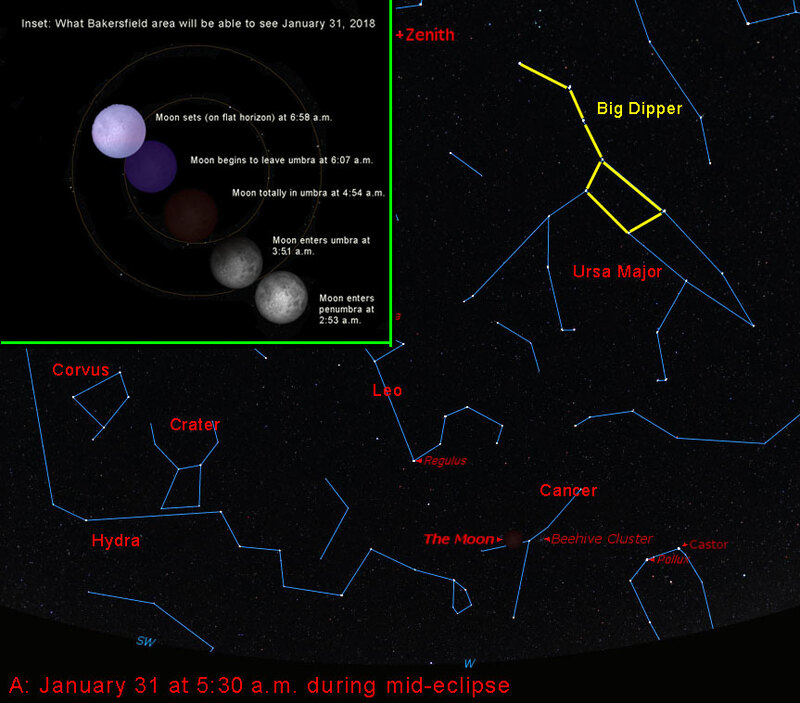 The first show of the season will be “Black Holes” on February 15, the day of a new moon. The term “supermoon” was invented by an astrologer in 1979 for a full moon that happens when the moon is closest to Earth (at perigee) in the moon’s elliptical orbit around Earth because “supermoon” sounded cooler than the term “perigee full moon” used by scientists (also easier to say). January 31 also marks the 60th anniversary of the United States entry into space with the Explorer 1 satellite launched on top of a Juno booster from Cape Canaveral in Florida. Unlike the Sputnik satellite that just beeped to let people know it was in space, our first satellite was a science satellite that returned data about the Van Allen radiation belts. Concerned about the growing military-industrial complex, President Eisenhower wanted our entry into space to be a peaceful exploration of space. One interesting piece of recent astronomy news is the ice cliffs spotted on Mars. They are about 100 meters thick of relatively pure water ice capped by a layer of rock and dust about 1 to 2 meters thick. The eight cliffs found so far are at latitudes of 55 to 58 degrees latitude. Although we knew there was ice below the surface, we didn’t know how far below the surface it was and how deep it went. The water ice would be easily accessible to human explorers and there’s a lot of it. Besides its use as a resource, the exposed ice can reveal the past climate history from ice cores just like we’ve been able to do with ice cores here on Earth. Our ice cores have revealed the coming and going of several ice ages that we now know are tied to subtle flexes of Earth’s orbit and changes in the tilt of its axis. The same orbit flexes and axis tilt changes happen on Mars but are more extreme because of its proximity to Jupiter and the lack of any big moon nearby. There are A LOT of interconnected things on Earth and its environment that make it be such a nice place to live!